This is one of the 108 sacred places of Lord Vishnu and the 7th Nava tirupathi dedicated to Sani Bhagavaan or Saturn. The place known as ‘Tirukkulandai’, is more identified as Perungulam. The residents of this village recognize their dwelling as ‘Perungulam Perumal koil’ and thus associate it with the temple. Though a small village now, inscriptional evidences show that it must have been a big city, once upon a time. The temple too remains impressive, without much damage. 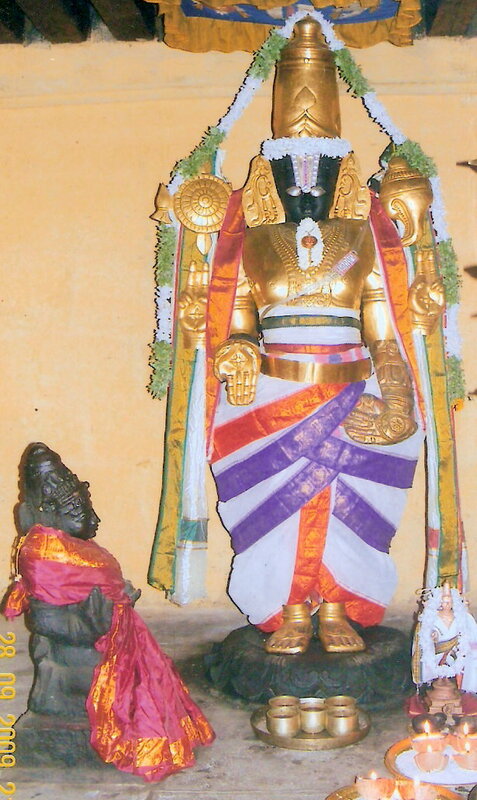 Sreenivasan, the Prime Deity, stands majestically facing east under the Ananda Nilayam vimaanam. His Spouses have their place near him and do not have separate shrines. The Utsavar or procession deity is called ‘Maayakkoothan’ or Soranathan in Sanskrit. The interesting feature is that Garuda, who is usually installed opposite to the Moolavar, dwells as Utsavar in the sanctum sanctorum itself. The icon of the Prime Deity, enfolded on both sides by his Spouses, displays Kamalaavalli or Kulandaivalli blissfully seated in His chest. Vedhacharan and Kumudavalli were childless. They bathed in the river here and undertook penance. Pleased with their prayers, Lord Vishnu blessed them with a daughter. The daughter, Kamalavathi, turned out to be no ordinary girl. She desired to marry the Lord himself and to this end, she relentlessly pursued the Lord offering daily prayers. Moved by her sincerity, the Lord appeared before her and asked for her wishes. Delighted at having darshan of the Lord, she said that her mind had not changed and HE was the one that she wanted. Granting her wishes, he accepted her and took her in his chest. It is believed that Lord Vishnu came on his Garuda Vaahanam to defeat Asura Asmachaaran. Having defeated the asura, Vishnu is said to have performed his victory dance standing on the asura’s body. The Devas who watched this 'dancing victory' of Lord Vishnu wanted him to provide darshan here as ‘Maaya’ ‘Koothan’. Since Garuda was instrumental in bringing the Lord to this place, he was accorded a special status at this temple and is seen as a Utsavar. The temple is open from 07:30 a.m. to 12:30 p.m. and from 04:30 p.m. to 07:30 p.m.
Perunkulam is 6 km from Tirupuliankudi on the same road. Bus facility is available from Tirunelveli and Tiruchendur. Hiring a cab will be more convenient. The place is 42 km from Tirunelveli.